David and Ann Reif make beautiful jewelry and travel the country selling it at craft fairs. 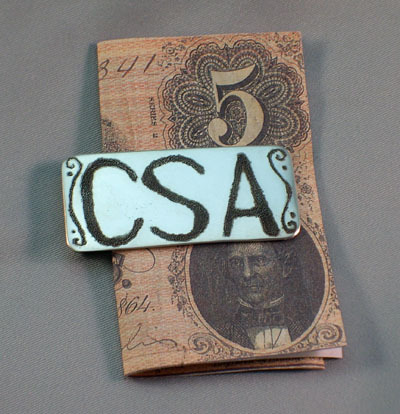 They have donated to Southern Heritage News & Views and The Southern War Room a contemporary design hammer engraved sterling silver money clip with durable nickle alloy clasp. The face is 18ga sterling silver with a hand buffed mirror finish. It has a quality mark, hallmark, and is signed and dated. I will raffle it to bring in funds for SHNV & SWR. Dave gave the following explanation for engraving it as he did: "Hammer engraving is the proper term but the technique is also called soldier engraving or trench art engraving. Look up "Vietnam Zippos" for a recent example. In the long hours with little to do sometimes soldiers would get a nail and a piece of metal and hammer or punch the metal into patterns, designs, or the name of their sweetheart. Instead of doing a fine-line engraving on the clip I decided to use this technique which is much closer to what our boys might have done." Raffle tickets are $1.00 and can be sent by PayPal or check. Email me at demastus@aol.com for mailing address. I won't send out tickets but will put your name on a spread sheet, once for each dollar, and cut them out and draw names in about a month.